Blagdon are the Pond Masters and it's no wonder why, when you when you check out this 'Monsta'! This patented design uses the latest technology to make cleaning a pond easy, quick and safe for your fish. The economical, powerful suction removes pond waste up to 32mm in diameter with the choice of recycling the water back into your pond or removing the water for a more thorough clean. The year round problems of leaves, sludge, blanket weed and stones can now be removed easily, leaving your pond in pristine condition. • Easy - in pool near neutral buoyancy allows ease of movement around the pond floor. • Quick - 4 times faster than other pond vacuums. • Effective - Powerful suction, removes leaves, stones (up to 32mm), blanketweed and sludge. Up to 6000 l/h flow. • Safe - Pond floor intake prevents any harm from coming to the fish. • Control and safety - Remote control Power on / power off switch. • Environmental - The Monsta collector allows - collection of 2mm or more solids for composting and allows water to be recycled to the pond or used to water the rest of the garden. 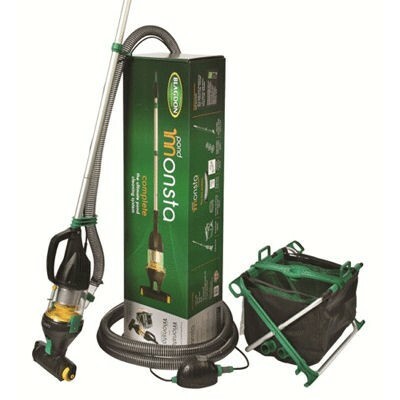 Complete with Pond Monsta and Pond Monsta Collector accessory and full manufactureres warranty.